Jesse Ball has had a fervent, if initially small, following since the publication of his first novel, Samedi the Deafness; and before that, an avid fan base for his poetry. The Chicago Tribune called him a "young genius,” he's won the Plimpton Prize, and been longlisted for the National Book Award. His work stretches the boundaries of what fiction can do — his spare, poetic prose encompasses philosophy as much as plot and his novels contain an enduring and appealing strangeness, often presented through mysteries or puzzles. He's been compared to Calvino, Borges, and Auster for his experimental and sometimes absurdist style. Census, his latest novel, contains some of those elements — the main character's late wife was a "physiotelepath," a kind of performance artist clown, and the book is structured alphabetically as the characters move through towns named A, B, C, etc. — but the novel is largely focused on the relationship between a father and his mentally disabled son, and is one of the most graceful, poignant, and generous stories I've read in years. In a starred review, Publishers Weekly called it, "[an] intensely moving and dazzlingly imagined journey….A devastatingly powerful call for understanding and compassion," and Booklist describes it as a "mind-bending, gorgeously well told, and profoundly moving fable." 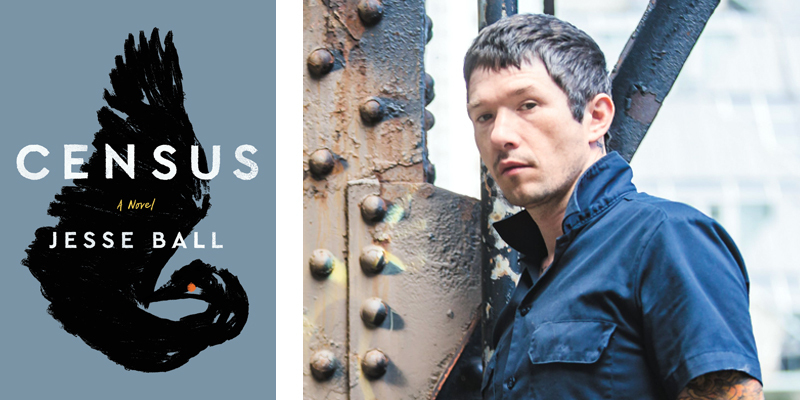 I've watched happily as, with each new book, Jesse Ball has reached a wider audience, and Census is a marvelous and necessary novel that we are proud to offer as Volume 72 of Indiespensable. 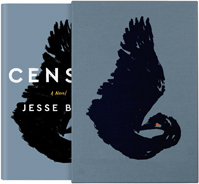 We're thrilled to present Census by Jesse Ball as our selection for Volume 72 of Indiespensable. Powell's subscription club delivers the best new books, with special attention to independent publishers. Jill Owens: Your introduction to Census, which is about your brother and your reasons for writing the book, is beautiful. I was wondering if you could summarize or describe it for people who haven't read the book yet. Jesse Ball: Many of the books that I write are parables of a sort. I guess for me, I want to write about things that are meaningful. And for me, to be meaningful, they have to somehow be entrenched in regular life. So my fiction is largely nonfictional, because it's at the crossing of roads where life occurs. In many of the early books, there's a deep social concern for one thing or another. For this one, I realized that my brother Abram — who passed away many years ago, he had Down syndrome — I realized that I had never had a character with Down syndrome in a book that I had written, even though of course I've written many books. And I thought I should do it. But one of the reasons I think that I was reluctant to do so in the first place is that it's very difficult to use the English language, which is in many ways the language of the oppressor. The historically weak in England or in the United States have not necessarily been treated very well. Furthermore, it's a language that has given itself over entirely to wealth and to corporate interests. So it's difficult to speak about subjects who do not participate in a substantive way in the creation of the language that you're going to speak about them in. I had to find a way to write about people like my brother in English, when the language itself is an enemy. That was one of the reasons for writing the book, and one of the problems that I had to navigate in writing it. Jill: Is that in part why, as you write in the intro, you set about making a book that was "hollow" — in terms of writing around the character of the son, to have him there in his effect? Ball: That was the solution, or the attempted solution. Of course, I can't be the one to say if it succeeded or not. Jill: How did you go about doing that? Ball: For me, the process of writing is a matter of being surprised. I try to set up circumstances that are somehow programmatic, [meaning] I'll have some sense at the beginning of the book that it will take place over a particular time period — it might be a week or a day, an hour, something like that. Apart from something basic like that, I don't really know very much about what's going to happen in the book. But then when I sit down to write, the thing must be alive as I write it, which means that I have to be surprised each time I turn the page and begin the next one. If I wasn’t in this delighted, confused, wandering stance of the reader as the writer, I don't think the book would be any good. The book's not constructed there. It's as if someone's whispering it in my ear. The characters are only partly characters. They're characters enough to court the coming of this other thing. Jill: One of my favorite things about Census is the character of the wife, the son's mother. I found her absolutely surprising and fascinating, the way you describe her performances and her philosophy. I was wondering how she came to you. Ball: I don't know. I'm trying to think about what the first mention of her is in the text. She needed to be someone who was completely open to transforming herself in light of receiving this child. That was necessary. And I suppose the style of the book — it's in the voice of this doctor whose tone is a little bit circular and verbose and at times even sententious. He is generous and perceptive, but there's a little bit in the voice of an old storyteller who doesn't mind hearing himself talk. Such a person is really only part of the answer of what I wanted that household to be, and that left a negative space in which the other half existed, which is this woman to whom he once gave himself completely. There was a lot of room in... Because the way they lived together is this buoyant thing behind the text, which is his voice — I think that's how she came to be, out of that space. Jill: I like that you used the word "buoyant." Obviously, the subject matter is frequently quite serious. The father, the doctor, is dying. However, there's something about the spaciousness of your writing, and the joy in some of the characters, that does, I feel like, give it a buoyancy. As you say in the intro, you describe what is in your heart as you consider your brother's life as something so full of light, and I think that really comes through in the tone of the book. It seems to me that the text, in order to engage the living reflection of the reader and enter into their body, needs to be playful. The book, however… you could even say the darker the book, the more playful it must be. Even the awful things that happen to us are themselves alive, lithesome and bantering and laughing at us as they stamp on our heads. [Laughter] There's always humor there in the fiber. Jill: How did the concept of the census itself, or this census in particular, occur to you? Ball: Sometimes, when you're working with an idea, or with a scene, or a character, anything in prose or narrative, especially, the quality that you're trying to evoke, or statement that you're trying to evoke, need not be entirely in the right place, or in the thing that's being evoked. It can be moved around into other places. An example would be: A couple is having some kind of a quiet argument. Neither one is exploding. But then they see some horrific car accident, which is described in detail. Actually, that description of the car accident is really just the emotional content of their conversation. So with the census, this is not something I was doing intentionally. But it's the sort of thing that I want to do and then it happened. I guess we can have a philosophical argument about intention, even to begin with, but in this case, with the vision of the boy in the story, part of the point of the book is to somehow give the reader occasion to feel what this person's life is like, or what he sees, how he sees, and how it's different. I think sometimes stipulating a paradigm elsewhere in the text can give the reader the opportunity to ruminate on it vis-à-vis other things that are happening. In this case, the census is going around and trying to ascertain what the sum total of human life is, and what all of these human beings are doing at any one time on Earth. That ascertainment that the census is desirous of, which is really kind of ridiculous, in the way of the introduction of a paradigm, creates the opportunity for the reader to say, What is the census that I, myself, am attempting as I go around? Like, I'm some kind of scientist and my life is some kind of taking of samples, some kind of iterative and reiterative study of things. What is my own census? And then in this book specifically, what is the census that's being conducted by the son? If I wasn’t in this delighted, confused, wandering stance of the reader as the writer, I don't think the book would be any good. Jill: As you were writing all of the characters — the man and his son and the different people they come into contact with — were you thinking about them as representative of the sum total of human life, of being pieces of a whole; and did you balance them in some way because of that? Ball: I wouldn't say they're representative, but then samples usually aren't representative, which is why you need so many. One of the things about novels and books is that the characters don't fundamentally exist, as such. It's a paper, a theater… you and the reader must agree on this covenant of what will be given and what received. But what we actually want is not for the characters themselves to simply be real as a person is real. Rather, that the writer can somehow, in some shamanistic state, disclose this... Rilke's apple in a child's mouth, you know? That this thing bursts forth that breaks language, and is a gift of one heart to another. And at the point of such a gift arising, the characters cease to matter. What was supposed to be happening — "This is a book about race cars." — just doesn't matter. Now it's this other thing, which is much more important than anything else. The narrative structure of the book is just to allow the story to reach such a place. Like flamenco, when the dancer jumps up in madness and rides across the tiny stage, this demon has to enter the room. The characters are only partly characters. They're characters enough to court the coming of this other thing. Jill: As I was reading it, I was thinking that it reminded me a bit of parables in Christianity and in other religions in which people are judged on the way they treat unexpected guests coming into their homes, who are sometimes gods in disguise. I wondered if that was in your thoughts at all. Jill: Early on, the father says that when their son was born, their lives "bent around him like a shield," which I thought was such a beautiful simile for what happens to a degree with any child, but much more, I would imagine, with a child who has a disability. Your prose is very lyrical and very clear. You're also a poet. How does your poetry inform your prose, or vice versa? Ball: I think both things are just fundamentally practical, as practical as they can be. Whatever the needed form is, the language that I use attempts to reach a complete utility in it. In that sense, I don't want the book to reflect positive things about me as an author, or make statements about what I know. I want it to be a gift, something apart from me that the reader receives. Any quality of the text is just the [implement]— it's shaped as a knife, a fork, or a spoon. I don't actually think of myself very much as a writer, but more just as a person. I think it's hard enough trying to be a person day after day, and doing your due diligence to the people around you. Then every now and then, it's time to write a book. At that time, I try to address it the same way I would anything else. Jill: At a certain point, the father and son encounter some people who are openly hostile to them. You write, "It became clear to the family…that we were the enemy, or, if not the enemy, then the messengers of the enemy, the enemy that they had heard about for so long.…It is my opinion that everyone who was not one of them was to them draped in poison. We appeared out of the south wearing green clothes of poison." This is one of the most poetic and clarifying descriptions of "othering" that I've read, and it feels particularly precise and relevant right now. I found this entire section with the family fascinating; how did you decide to include them? Ball: It's interesting. I wrote this book… I think it was right at the end of December 2014 and the beginning of January 2015. And about six months before that, in August 2014, I wrote How to Set a Fire and Why. The voice of How to Set is the voice of a child, even though she's very smart. The certainty with which the father goes about saying what he does in Census [is similar to the way that] I like to make distinctions in life, where language moves between registers. But in How to Set a Fire and Why, such a thing would have ruined the voice of the narrator. It was very comfortable, then, to take up the father’s voice. Which is, as I said, a little… you can see that even in this iteration, where he describes their alienation, and then in most of the poetic image, he's part of some tradition in that moment, a tradition of seeing. As for the general alienation, it is absolutely the state of our society. People are just… I'm living in the South right now. Jill: Where in the South? Ball: I'm in Mississippi for the year. It's interesting, because I live in Chicago. Chicago is, I think, the visible wound of America, where things that are hidden elsewhere or are coated over are just very obvious, like race relations and totalitarian regimes. I think the South is interesting, because there's a lot of courtesy here on the surface. But then it just feels like everyone is in their trucks, and they're driving back to their separate houses to all be separate from one another. Even the way people behave in the grocery stores —it just feels like it isn't human life. I think the suspicion that naturally occurs under those circumstances is just growing and growing in society. In that way, the work of the census is radical. To be able to go up to people's houses and see them in the places that are theirs is something that we don't often do. I even have some friends whose houses I’ve never been to. They don't like to have people to their houses. [Laughter] You wonder what it's like in there. Jill: It's a breaching of a boundary that's very intimate. I so loved the inclusion of Mutter, this character you created of a woman who wrote obsessively about cormorants. I was half-convinced that she was real, and then couldn't find any trace of her. Ball: I think that was an outgrowth of when I was writing the father's voice. After the foreword, the book begins with the page where he's describing the grave. As an opening, the language can be very risen, oily, and thick. However, the basic content of the book, which will continue to be in his voice, cannot always be that way, or must be that way only on occasions where it’s emotionally merited. Otherwise, the scale of the thing will fail and the reader won't be able to continue because it just won't make emotional sense. You can't always be throwing out these peaks of expression willy-nilly wherever you feel like. Therefore, I think — I mean, this is my interpretation, I'm not the person who wrote it; now, I'm different from when I wrote it, and so I can only make a judgment about what I might have thought or felt. But thinking back to this person who wrote Census, and the way that he went about things, I would say that having Mutter allows for emotional peaks of various sorts to be reached by reference. The things that I could equally have done in the father’s voice would have required a lot of plot to be permissible, legible, and rational. Whereas when it's in a Mutter text, you can just be thinking about that. And then it's perfectly reasonable for there to be some deep, philosophical thing that has arisen, because this false object of prose, the Mutter book, is enough to facilitate the appearance of that idea. Does that make sense? [My] fiction is largely nonfictional, because it's at the crossing of roads where life occurs. Jill: Yes. I love the obsessiveness of it, which then does translate to the rest of the book. You write that she used the same sentences again and again, "where it ceases to be self-plagiarism and must be seen as a refrain," which I thought was such a beautiful concept and sentence. You write in the introduction that it occurred to you "last month" that you wanted to write this book. Did you write it that quickly, and is that your process? Ball: Yes, I usually write a book in about a week. Jill: Oh, my goodness. [Laughter] That's really quick. Was this also about a week? Ball: I think this one, I got a little interrupted. It was around Christmas. I think I wrote it for three days, and then maybe we had Christmas. Then for another three days. Jill: I believe that for one of your earlier books, you wrote an essay for us which was illustrated with a lot of photographs about writing the book in a castle. Ball: That was for Samedi the Deafness. Jill: That's what I thought. Unfortunately, that essay has vanished into the abyss, but I remember the photographs, pages hung up on what looked like clotheslines. Ball: At that time, I was a little bit slower. I think that was my second novel. The first one was The Way Through Doors, but they came out in reverse order. In order to preserve the feeling of inquiry, I would cover the walls, ceilings, and everything else with the pages as I wrote them to really make me feel like this was an ongoing enterprise into which I had to pour myself. Jill: How do you think your writing has changed over the years? Ball: From book to book, I think things are often quite different. What's needed is different. In the first phase [2003-10], there’s March Book, A Picnic in Ten Years' Time, Amok Book, and Parables and Lies, The Way Through Doors, and the early novellas, Pieter Emily and The Early Deaths of L, B, H, C, everything up until The Curfew. And then one that hasn't been released yet called Plainface, although part of it was published in the Paris Review many years ago. And also The Lesson. The Lesson is probably the last of that phase, I think. This was like a lyrical phase, where all of these works have the intensity of lyrical expression above anything else. Then I think the second phase [2011-present] begins with Silence Once Begun. And those works are much plainer, except for the second section of Silence, the Jito Joo section. That's where all of that energy is isolated. But that's a fairly short section. From that point on, I would say the books are much less lyrical in general, leading up to this one. And it's not just lyricism. In a lot of those early books, something being strange was sufficient in and of itself for me. I was charmed by strange things, coincidences, and the natural revelatory content of coincidence. As time goes on, the books become more pointed than that. Jill spoke with Jesse Ball on February 6, 2018. Jesse Ball was born in New York. He is the author of 14 books, including How to Set a Fire and Why and, most recently, Census. His works have been published to acclaim in many parts of the world and translated into more than a dozen languages. He is on the faculty at the School of the Art Institute of Chicago, and won the 2008 Paris Review Plimpton Prize, was long-listed for the National Book Award. He was named one of Granta’s Best Young American Novelists, and has been a fellow of the NEA, Creative Capital, and the Guggenheim Foundation.